Q2. This is what I like about H!P. Shimizu Saki: We all feel like rivals to one another, but everyone has things about them that are worthy of respect. And with that, I like that spirit of cooperation, when everyone comes together as one!! Tsugunaga Momoko: That we don't have sousenkyo elections (laughs). Even though I say that I'd be all right, since I'd definitely be number one, if we were to actually carry one out, could it be that even this 'gutsy' Momochi might be taken down......!? Tokunaga Chinami: We're all over the place. It's amusing how personality-wise and looks-wise, we're all over the place. Sudo Maasa: Our good relationships! I think it's wonderful how, regardless of group, we can all spend time together, talking about all sorts of things. Natsuyaki Miyabi: I like how each and every one of us has their own strong unique aspects♥ And that everyone's competitive!!! Sugaya Risako: Individuality!! I don't think that there are people of the same type. Yajima Maimi: That there are traditions. There are a ton of things that have been built up by successive generations of senpais, and I think that's what led to the Hello! Project of today!! And so, I'd like to properly inherit the things we learnt so that Hello! Project will always continue beyond this. Nakajima Saki: The faces of everyone enjoying themselves on-stage! It's brilliant---. Suzuki Airi: That there are many people that I think of as companions ♥ It's changed greatly from the Hello! Project of the past, but but we have to carry on the things that were made by the senpais. Okai Chisato: That we go all-out singing and dancing ♥ With just that, we won't lose to any idol!! Hagiwara Mai: There are lots of wonderful senpais. Fukumura Mizuki: There are an extensive number of songs that have strong messages or capture the cute expressions of a girl's feelings. Also, when we enter the interlude, I like how all of us do a lot of high-energy songs together! I think those who come to concerts will understand, but that sense of unity is the best!! 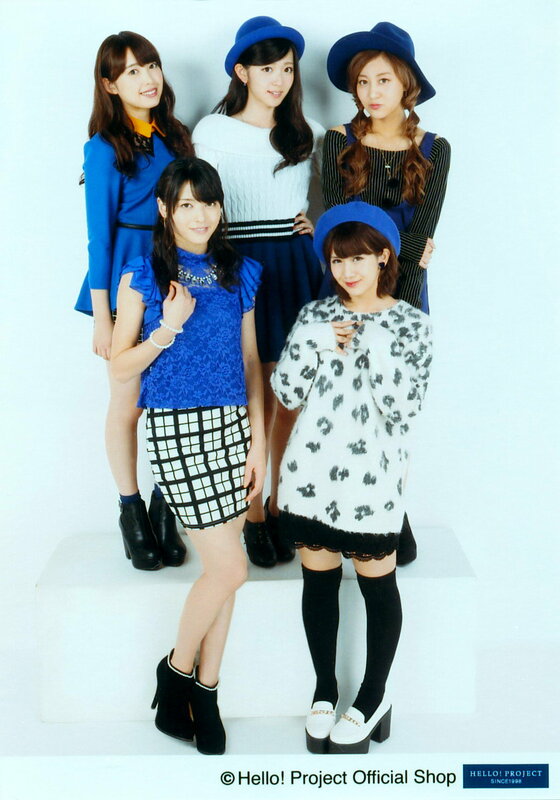 Ikuta Erina: The faces of the members. There are all sorts of facial types lined up that you won't get bored watching them. That's something about us that's really great. Sayashi Riho: That I constantly feel motivated! I feel that the performances of members I haven't met in a while are constantly levelling up, so it makes me think that I have to change too. Thanks to that, my desire to improve myself goes up. Also, since there are lots of members, it's really fun for someone like me with a 'parts fetish' to look for each and every member's good body parts (lol). Suzuki Kanon: I like how there are girls with all sorts of characters, and the more you get to know them, the funnier they get. Iikubo Haruna: That there are lots of cute girls. The dressing rooms are overflowing with cute things, and there's a nice scent...... I think it's the greatest paradise♥ Watching photo shoots being done, the words 'How cute~' keep flowing out. Ishida Ayumi: On-stage, we're cool, but behind-the-scenes, we're cute and having fun, that difference is nice. The other face of the idol world might have this scary image, but I can boast that whether out-in-the-open or behind-the-scenes, Hello! Project is wonderful. Sato Masaki: I think it's how the personalities of each and every member differs. That's the Hello! Project I love. Kudo Haruka: We're cute and good at singing, and we've got lots of Hello! Project fans in the ranks of other idols, so I think that we're perfect as idols. Ogata Haruna: That it's cheerful and cute with established idol groups. Also, the kind fans. Feeling the constant support given to us makes me really want to work hard. Nonaka Miki: The members are all cheerful and have their own uniqueness! Makino Maria: That Tsunku♂-san treasures Hello! Project.When I was a Kenshuusei, I was really happy to be picked for a Hello! Con, I look up to the really lovely H!P senpai who are adorable and stylish. I love H!P. Haga Akane: The characteristics of each and every group are different, but when all of us gather up and move in unison, we become the strongest group! Wada Ayaka: Even though everyone's cute and funny and kind, their dancing and singing is perfect. The performance level is high!! How amazing. I'd like to become like our senpai too. Fukuda Kanon: That each and every one of these young girls do their job properly as idols, they're all professionals regardless of age. Nakanishi Kana: Everyone's kind and cute! Tamura Meimi: That everyone's cute and is capable. Murota Mizuki: Everyone's good at dancing and singing! Aikawa Maho: That we have both cool songs and cute songs. That we're good at dancing. You won't get bored watching our concert performances. Sasaki Rikako: Singing live, as a whole, everyone's at a high level. I think that we're the coolest among idols. Kanazawa Tomoko: That both our performance ability and on-stage awareness are high, I always feel the pressure , but I don't let myself forget my desire to improve myself, it makes me think that I've got to work harder! Hello! Project isn't just cute idols. Takagi Sayuki: That we're proud and have a high level of professional awareness. That's great. Miyamoto Karin: Everyone goes at full power! With everything they've got!! The level gradually increases...... That's what I love! And the abundance of songs. Uemura Akari: There are tons of fun girls packed with all sorts of characteristics. For example, just having Tokunaga Chinami-san chatting away makes the place feel excited. Yamaki Risa: That we're idols but not idol-like! Our lyrics are interesting, our dancing is so intense that you wouldn't think we're idols, the punch of our singing is impressive that it would topple the musical idol types, that's what I like about H!P. Inaba Manaka: Each and everyone has their own unique characteristics, and the high levels of the cute compositions and wonderful performances. Morito Chisaki: How fun the mood is. 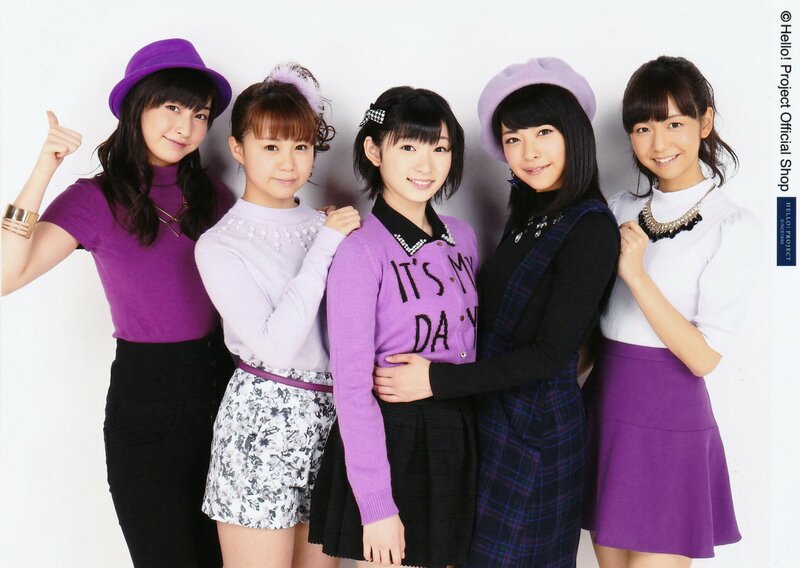 Shimamura Uta: I like how all the members have this sense of freshness where it's bustling like a girl's senior high. Everyone's really kind, it's an honour. Ozeki Mai: I enjoy the parts where we get to sing and dance together with other groups at Hello! Cons and the such!